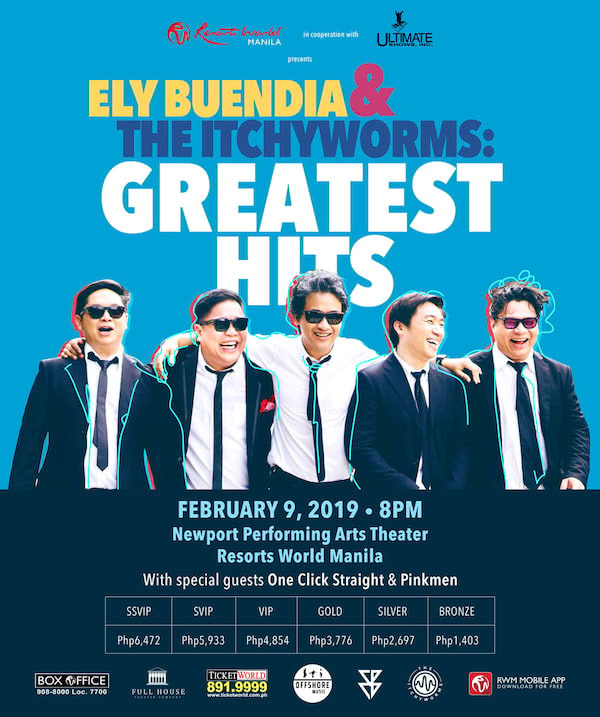 Resorts World Manila is about to thrill Pinoy Rock fans as is sets to stage for two of the most iconic names in Filipino rock music in one evening with Ely Buendia & The Itchyworms: Greatest Hits on February 9, 2019, 8PM at the Newport Performing Arts Theater (NPAT). Ely Buendia shot to fame as the lead singer and guitarist of Filipino rock band Eraserheads, along with penning many of the band's greatest hits. Still active in the industry, he is now one of the most highly respected names in OPM. Heavily infuenced by Ely Buendia and his peers, the Itchyworms - Jugs Jugueta, Jazz Nicolas, Kelvin Yu and Chino Singson - has made its mark in the OPM scene with easily-relatable, richly performed songs such as Di Na Muli, Akin Ka Na Lang, Beer, and Ayokong Tumanda. In 2016, Ely Buendia and the Itchyworms collaborated on and releashed the song Pariwara, which was well received by Pinoy rock music fans. This was followed by "Lutang" - another unfinished verse-chorus idea of Buendia which found full expression with the Itchyworms. Their creative collaboration stretches back to late 90's, resultin in an impressive compendium of collaborative works, including the Itchyworms' first offering "Revenge of the unsigned" which buendia helped produce. The Itchyworms in turn contributed to the debut album, "Fair Tales" of Domino - the band of Buendia's sister. The itchyworms drummer Nicolas would take on keyboard duties for both iterations of the Earserheads' Final set reunion concert in 2008 and 2009. Tickets to Ely Buendia & The Itchyworms: Greatest Hits are available on www.ticketworld.com.ph or at the RWM Box Office (+632-908-9000 loc 7700). Download the RMW Mobile App to receive updates and special promotions on RMW shows and events.